Saturday night was a night of firsts for Sockeye 2013. It was the first time that the entire roster was together. It was the first time that Sockeye was playing in semifinals since 2010. It was the first time in the last few years that Matt Rehder was healthy for the entire Club Championship tournament. It was Joe Sefton’s first Club Championships on Seattle’s offensive line. It was the first time Sockeye coach Roger Crafts thought his team had the capability to go to the finals. It became the first time that Sockeye earned a finals berth since 2007. That’s right, when asked when he knew that his team could make it to finals, Crafts had a surprising answer. Though Crafts’ answer may come as a surprise to many, it truly shouldn’t. Sockeye dragged itself through the regular season relying heavily on a very small portion of its roster. Due to injuries and other personnel issues, Sockeye was pigeon-holed all season into what it was capable of doing of doing on the field. While this caused difficulties for the team during the regular season, it meant that Seattle had things it was comfortable doing that it could rely on in a tight semifinal game against Boston Ironside. 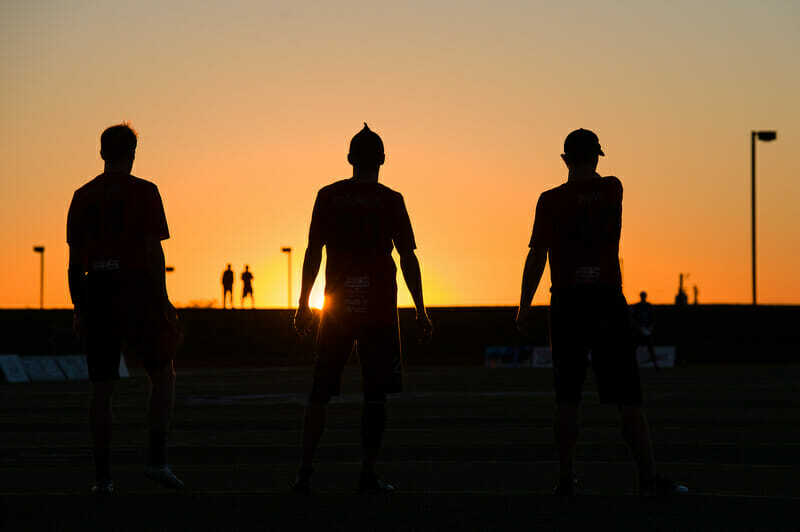 For instance, late in the game, Sockeye’s handlers chose to take over the movement of the disc in a quick, aggressive, handler oriented offense that kept Ironside’s defense on its heels. The importance of that small ball was emphasized by Ironside in preparation for tonight’s game and captain George Stubbs saw the effectiveness of Sockeye’s playing style firsthand. “You can’t stop a team from doing what they practiced,” Stubbs said. In a similar vein, Ironside was unable to eliminate Seattle’s mainstays and their impact on the game. All weekend long Sockeye’s Matt Rehder has been a key to his offense moving up the field and scoring the disc. Saturday night was no exception. While any observer of the tournament would be able to predict Rehder would have a big impact on semifinals, Rehder would not have made the same prediction just one month ago. Miraculous was just the word to use. At different points during the game Rehder unleashed a 40 yard hammer, reeled in hucks for scores, and got a critical block on a hammer to stop a break. Sockeye could lean on Rehder as a leader and a star to make plays for them. Rehder certainly raised eyebrows all over the field. “There were a couple of moments where I was like, ‘Jesus Christ, I think he’s going to die,'” Stubbs said. Sockeye could depend on Rehder to make play, though they relied on other stars as well. Reid Koss has led the Fish defense all tournament; Koss got two blocks of the three turnovers that Seattle’s defense forced. Both led to breaks. Crafts enjoyed watching the peak of Koss’ maturation to an effective elite player. While Koss directs Seattle’s defense, Joe Sefton plays a crucial offensive role and has truly established himself in this season. While he continuously moved the disc in creative ways to keep Sockeye’s offense on the move, his most important contribution may have been to get open in the endzone when Seattle needed scores and keep the Fish’s spirits up in a game that always looked like it could go either way. When it was all said and done, Seattle pulled out the double-game point victory in a way that, looking back now, only makes sense that it would. Rehder, Koss, and Sefton led the way with help from a large number of other players. No one may have believed until Saturday night, including Sockeye, but the fact of the matter is that we may be meeting Sockeye 2013 for just the first time and, if you’re a first time team, well, there’s no pressure on you. Comments on "Meet Sockeye 2013: “It’s A Miracle”"